One word to sum it up: Delightful. Going into Morning Glory, there was only one reason I wanted to watch it: Rachel McAdams. Coming out of Morning Glory, there was only one reason to watch it: Rachel McAdams. Yeah, she has starred in some pretty crap titles, but she always manages to outshine that badness and be really good, right? That's certainly the case with Morning Glory, except for the fact that the material isn't actually that bad. Just let yourself go and enjoy the laughs, alright? Becky (Rachel McAdams) is a hard-working morning TV show producer, or at least she was until she got fired. Desperate to get a job, she finally gets an interview with Jerry (Jeff Goldblum) - who is desperate to hire a producer for the struggling show "Daybreak". Becky accepts the job and it proves to be more difficult than even she might be able to handle. She has to fire the sexist co-host, then try to convince egotistical news reporter, Mike Pomeroy (Harrison Ford), to take the job, and then try and get him to actually do the job, properly. And she has to do this while falling for handsome Adam (Patrick Wilson), and trying to save the show from plummeting ratings. Will Becky be able to hold on to her dream job and her sanity? Aline Brosh McKenna certainly seemed more at home writing a film about clawing your way to the top (in The Devil Wears Prada) than she did making a romantic comedy (27 Dresses). But what happens when she mixes both of those components together into one film? Well, you can take out the scintillating madness from The Devil Wears Prada and the Katherine Heigl from 27 Dresses, which may leave fans of The Devil Wears Prada wanting a little more, and fans of 27 Dresses still hung up on the fact that Katherine Heigl isn't there. While Morning Glory doesn't live up to The Devil Wears Prada, simply because the world of morning TV isn't anywhere near as interesting as the world of fashion, it's well written and really entertaining...you know, if you're a chick. McKenna seems to have this knack of telling stories of the workplace and how people struggle to have a social life and a work life, and she works that talent to a great effect in this movie, giving the audience plenty to laugh with and having characters we feel for. Giving that script to Notting Hill director Roger Michell only heightens it's ability to shine. Without Rachel McAdams, though, Morning Glory could have been a real clunker. I don't know what it is about this woman. She seems to exude this radiance and happiness that it is so impossible not to fall in love with her. Sure, she's dabbled in the more serious stuff lately (Sherlock Holmes, The Time Traveller's Wife...), but McAdams has impeccable comic timing which gives her a sharp edge when taking on her co star Harrison Ford. On the subject of Ford, well, he ain't as good as he used to be. 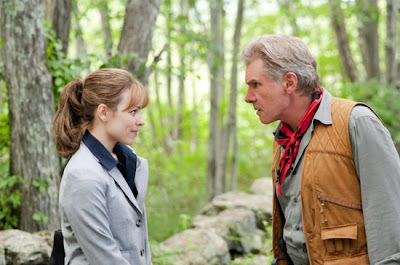 He's a little too arrogant in this movie to possibly even care for him, and Ford himself seems a little tired out. Diane Keaton, on the other hand, is superb as the show's main host. I'd love to see a show with just her on it, as she seemed to have that nice-but-really-a-dragon look down really well. Jeff Goldblum is good as the big boss and Patrick Wilson is always good to look at. As I said, Morning Glory is just the result of the loveliness of Rachel McAdams, plus a fine script which is packed with plenty of funnies. Just don't expect to much from it. THE VERDICT: Morning Glory doesn't offer any scintillating views on morning TV...instead it offers genuinely good fluff and a flawlessly funny Rachel McAdams.